With a November 2013 release, Disney's Frozen just missed Halloween. That means that everyone had to wait an entire year to dress up as their favorite princess or snowman—and that time has finally come. One costume that's sure to be a hit is Olaf, childhood snowman of Princess Anna and Elsa brought to life. Best of all, since he can survive in the summer, you don't need to worry about a snowy Halloween to make this costume feel legit—he works all year round. If you don't want to spend $200+ on a super-detailed Olaf adult costume or even $40+ on a children's costume, then it's time to DIY one. Below are a few easy video tutorials on making your own, with different variations of the popular Disney snowman. 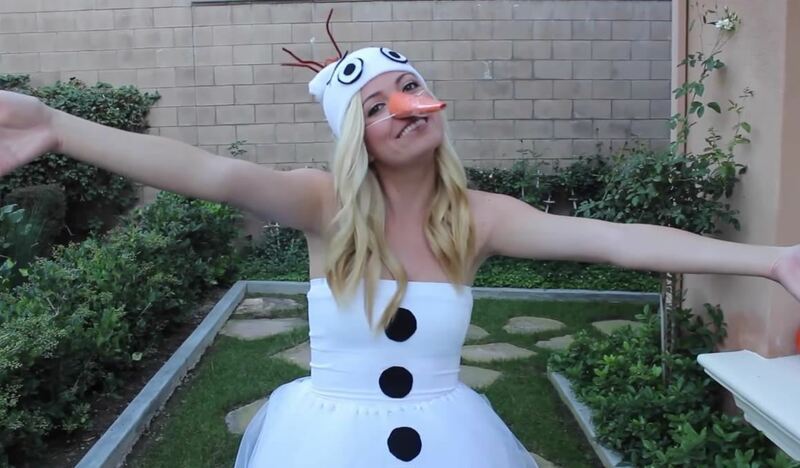 Eva, from MyLifeAsEva, designed her own Olaf costume that's really simple to recreate. It makes for a great group outing alongside other Frozen characters like Anna and Elsa. Best of all, it'll cost you less than $15. The total cost for all of these items came out to $11.75. The setup is pretty basic. All white everything. Use the black paper to make the buttons as you would for any snowman, use the orange paper to create a removable nose, and the brown piping gets stuffed into the beanie to make Olaf's hair. Take a look at Eva's video tutorial for all the steps. Since the items used are so simple and gender neutral, this costume can be made for boys, girls, women, and men. Win-win-win-win. While Frozen wasn't short on princesses, girls looking for a "cuter" Olaf costume need to look no further. Unlike the costume made by Eva above, this option uses a dress and focuses a little more on making Olaf's head, eyes, and nose more apparent. Check out Dani's costume guide below for the walkthorugh, from her YouTube channel Styles by Dani. If the above options were too much work and money for you, try out of the guides below for interesting teenage girl versions. The following one, by YouTuber MayBaby, focuses mostly on eye and makeup designs. And this one by Marta Almeida is similar to Eva's up top, but uses a baseball cap for the eyes and nose. Want to make it a group ensemble Halloween this year? Get your friends to dress up as Princess Anna and Queen Elsa!